Dr. Sushil Vachani serves on the board of the Deshpande Foundation. He assists the Foundation in developing and implementing its strategy. 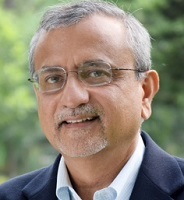 Dr. Vachani was Director of the Indian Institute of Management Bangalore from 2014 to 2016. Under his leadership, IIM Bangalore launched its ambitious MOOCs program in 2014. Other areas he focused on included nurturing entrepreneurship, including social entrepreneurship, increasing globalization of programs and enhancing social impact. Before joining IIM Bangalore, Dr. Vachani was a Professor of Strategy and Innovation at Boston University, where he served in many leadership positions during a twenty-eight-year career. He was Special Assistant to Boston University’s President for the India Initiative and a member of the President’s Council on a Global University. In the 1990s, he was the Director of Boston University’s International Management Program in Kobe, Japan, for five years. He also served as Chair of the Strategy & Innovation Department and as Faculty Director of the Doctoral Program. Dr. Vachani was a core faculty member for the Boston University Executive MBA program for several years and was awarded the John Russell award for teaching excellence by the Executive MBA students twice. Dr. Vachani has a doctorate in international business from Harvard Business School, a Postgraduate Diploma in Management from Indian Institute of Management, Ahmedabad and a Bachelor of Technology in mechanical engineering from Indian Institute of Technology, Kanpur. Dr. Vachani serves as a Non-Profit and EdTech Advisor. He believes that NGOs can benefit from selectively adopting strategies and techniques from the for-profit world. He is passionate about promoting the use of technology to enhance the quality and reach of education. He believes each sector (government, non-profit, corporate and start-up) has a role to play. He is very interested in supporting EdTech initiatives in each of those sectors. Dr. Vachani has extensive managerial and consulting experience, having worked as a consultant with the Boston Consulting Group, where he was involved with designing business strategies for American, Japanese and European multinationals. He also worked in India as a research engineer with the Dutch electronics multinational, Philips, as a member of the Tata Administrative Service, the core executive cadre of the Tata Group, and as a finance manager with Tata Motors. Dr. Vachani’s research interests include the global institutional environment, corporate social responsibility and strategy at the base of the pyramid. His research has been published in leading journals, including California Management Review, Harvard Business Review and Journal of International Business Studies. He has published four books on topics ranging from multinational strategies and their impact on poverty, to global governance and adaptation to climate change.